Hi! Good to meet ya! I’m George. I’m a dragon. I’ve been around a few years now, since I came home from the hospital. No, I wasn’t born there, just found there, and that’s when it all started. 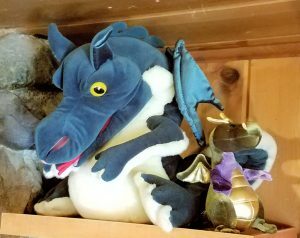 I have a big family of dragons at home. Dragons come in all shapes and sizes from all over the world. 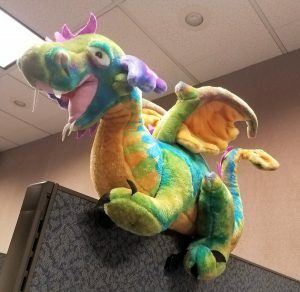 Did you know that humans from all over the world have stories about dragons, even though none of them really believe in us? Silly humans. Where do they think all those stories come from? But my family and I aren’t like most dragons. We don’t spend all our time curled up on a bed of gold and gems and sleeping and hiding. BORING! I’m a proper professional dragon. I’m a morale promotor at a large office, and am in high demand at my job. It’s a very responsible position. It’s not easy to keep all those humans smiling while they sit in those cubicles. I’m not sure why they do what they do, but I find it fascinating watching them run around and worry about things nobody can even see. Humans are funny that way. And now I have another job! Some people seem to want to hear from me, so now I’m supposed to write about stuff. I’ll be keeping my eyes open for things to make a dragon go hmmm….